Gary Siebein’s interest in acoustics was sparked during summers working as a stage and theater electrician at the American Shakespeare Theater in Stratford, Conn.
“Seeing plays, operas, musical performances and concerts night after night, and hearing all the theories about acoustics that the performers and stagehands brought with them developed my interest in acoustics,” Siebein said in an interview with the National Council of Acoustical Consultants’ newsletter several years ago. Siebein has parlayed that interest into an internationally recognized career as a researcher, teacher and professional acoustical consultant. Under his leadership, the College of Architecture’s Acoustics Laboratory has pioneered the development of acoustical modeling, measuring and evaluation technologies that are now part of the mainstream of acoustical design practice. 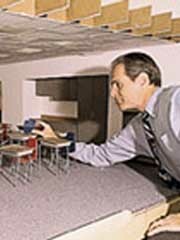 Currently, Siebein and his students are focusing on improving the acoustics of classrooms. This involves basic scientific research on acoustical measuring and modeling technology, as well as studies on how children listen and hear in actual learning situations. Siebein is working with colleagues at UF and the University of Northern Iowa on a book about this subject to be published later this year. Siebein and his colleagues also expect their research to form the basis for new school acoustics building codes under the Americans with Disabilities Act.